DRIVING RANGE ON THE GOLD COAST. THERE IS NOTHING QUITE LIKE IT IN QUEENSLAND! 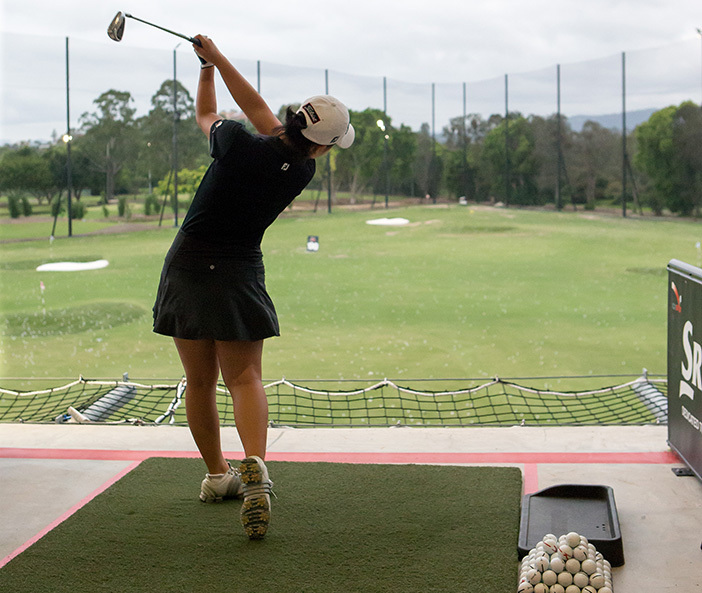 RANGE IS THE MOST UNIQUE ON THE GOLD COAST OPEN 7 DAYS PER WEEK FROM 5:30AM – 9:00PM. KDV Sport is home to one of the biggest split level driving ranges in Queensland with 40 private driving range bays available. With 5 target greens at varying distances, you can really zone in on your driving, chipping and short game practice. If its tranquil surroundings you seek, our range is surrounded by our golf course and Gold Coast Hinterland ensuring peaceful practice. The choice is yours whether you bring your own clubs or use one of our many hire sets available and car parking is never an issue with over 200 parks available to a facility which is open 7 days per week. After hitting on the range, why not head inside to our licensed restaurant for a coffee, beer, snack or meal. Memberships area also available from short term credit options to longer 12 month offers. With 40 undercover bays, there is no need to book with both large (105 balls) and small (45 balls) buckets available. 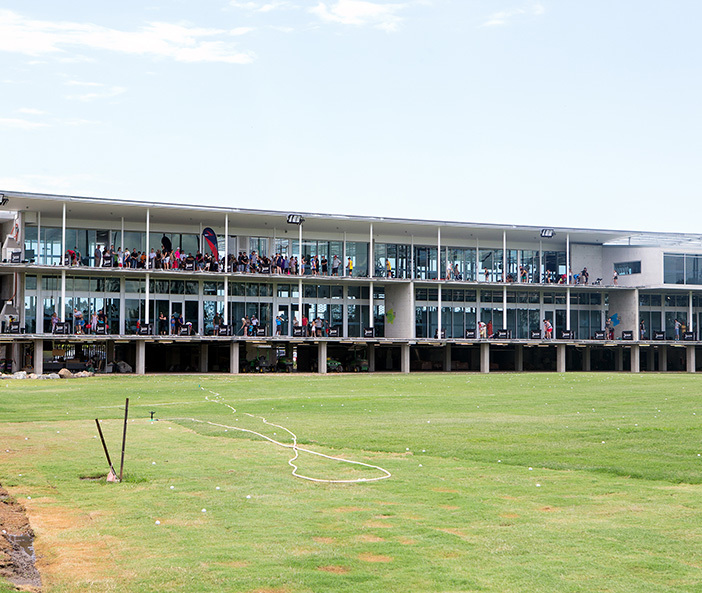 The KDV Sport driving range is one of the biggest on the Gold Coast and the ultimate training facility for all ages and levels. 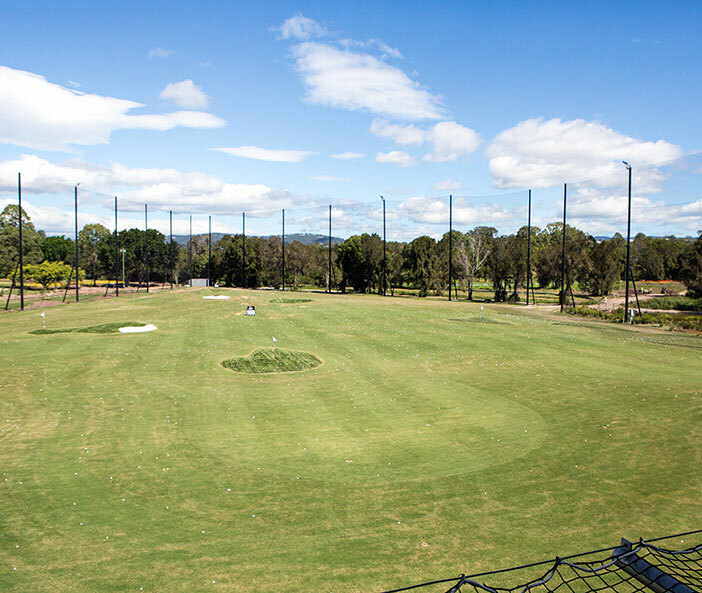 The largest driving range on the Gold Coast with 40 bays available overlooking the hinterland in the background. Each of the 40 bays is covered protecting you from the sun and rain and therefore allowing you access all year round! Become a range member and receive your own membership card which you can top up as often as you like! The KDV Sport driving range is the only split level, elevated range on the Gold Coast with 40 private, undercover bays available so you can practice your golf in rain, hail or shine! The largest driving range on the Gold Coast provides a beautifully designed arc providing golfers with magnificent views on the KDV golf course and surrounding Gold Coast hinterland. With comfortable spacing between bays, golfers can enjoy hitting from a variety of vantage points with varying distances and angles. A challenge all golfers will appreciate. The luxury of 40 bays means there is no need to book with membership cards available to ensure there is no line up for a bucket of balls. Just swipe and go! Have you ever hit off a split level driving range? 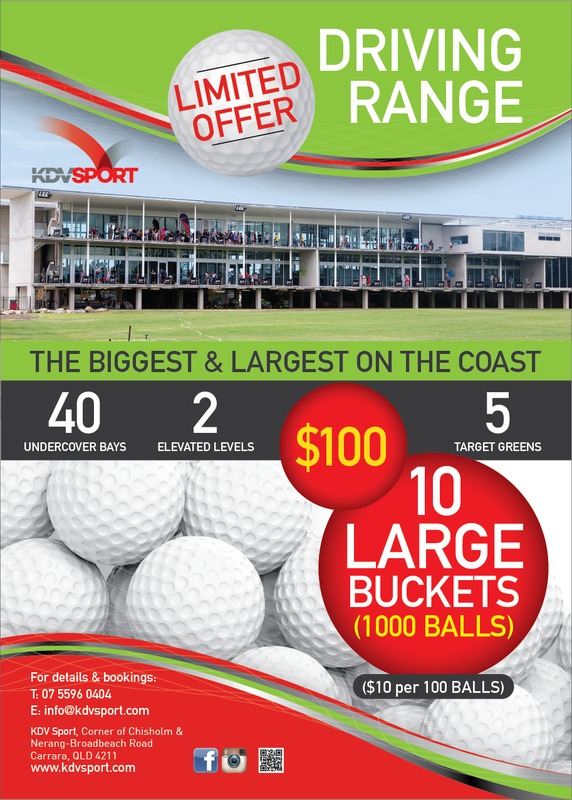 A rare opportunity on the Gold Coast for golfers and you can experience this at KDV Sport. The upper level provides sweeping views, cool breezes and quiet practice while the lower level is adjacent to our restaurant giving you quick access to food & drinks from Akademya Restaurant. A great range for both adults & kids where parents can closely watch their children while kids can feel the excitement of watching their ball fly off the mat on our elevated range! Whether you just want to hit a golf ball as far as you can or to practice more precision with your shots, the KDV Sport driving range provides you with both. With 50, 150 & 200 metre markers, you can practice your 9 iron chips or full blooded drivers. Supporting this is 5 target greens of varying distance and undulations to really test your ability. Grab a large bucket of balls and test yourself to see if you can land a ball on each green – with believe this will challenge even the most confident golfer. Everyone is welcome to enjoy the fun of the KDV Sport driving range. As the largest and most scenic range on the Gold Coast, you can enjoy a casual visit by purchasing a ticket at the reception desk or become a member where you will receive your own membership card and top up as required. Membership provides you with opportunities to use other parts of the facility and also means no lining up – simply walk straight out onto the range, swipe your card, select a large or small bucket of balls and your away!